We are now in the month of Damodara. It began on the full-moon night and will continue until the next full moon. Damodara is a name for Krishna. Dama means “rope,” and udara means “belly.” So Damodara means, “one who is bound around the belly with ropes.” And you can see in the picture of Lord Damodara with Mother Yasoda that she was binding His belly with ropes. The history behind the incident is that Mother Yasoda was feeding baby Krishna with her breast milk when suddenly some milk on the fire began to boil over. So, she set aside Krishna to attend to the milk on the fire. But baby Krishna had not yet been satisfied with His mother’s milk, and when she left Him He felt frustrated and angry. So, to vent His anger and to satisfy His desire, He broke a pot of butter that was hanging from a rafter on the ceiling. When Mother Yasoda returned from attending to the milk on the fire, she saw that the butter pot had been broken and she saw little footprints smeared with butter on the floor. And she understood that the mischief was the work of her son, Krishna. According to Vedic literatures, Krishna is the Supreme Personality of Godhead, so how is it that we are speaking of Him as if He were a baby who got frustrated and angry and made mischief? The answer is that every living entity has eternal love for Krishna within the heart, and that this love can be manifest in one of a number of relationships. The relationships we have in the material world are actually reflections of the relationships that devotees have with Krishna in the spiritual world. In the material world we have the relationship of servant and master; the relationship of friends, who are equals; the relationship of parents and children; and the relationship of husband and wife, or boyfriend and girlfriend. The relationships we have in the material world exist because they exist originally with Krishna in the spiritual world. Mother Yasoda has maternal love for Krishna, and her desire to serve Krishna as His mother is so pure and so strong that Krishna, to reciprocate with her, plays the role of her son and thus allows her to serve Him as His mother. 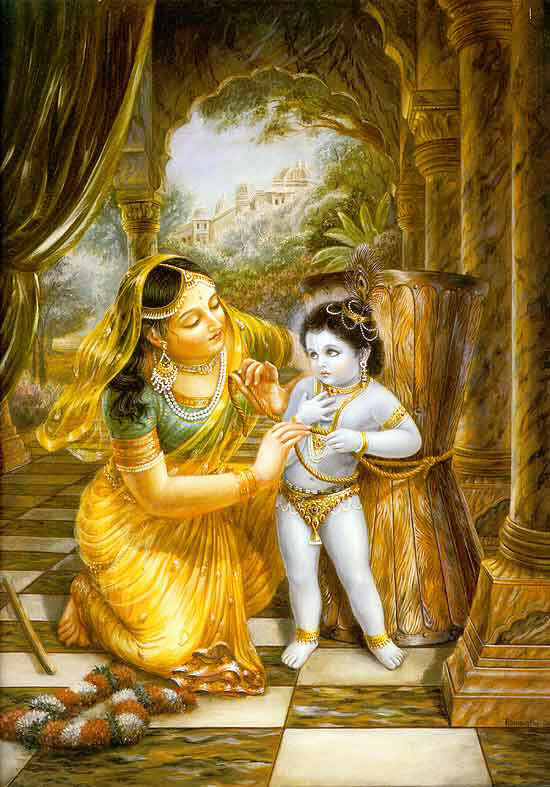 And when Krishna plays the role of Mother Yasoda’s son, He identifies with the role so much that He actually feels as if she is His mother and He is her son. After Krishna did His mischief, He knew that when His mother found out He would be in trouble, so He was anxiously looking here and there. And Mother Yasoda, after she put down the milk that had been boiling over on the stove, found Krishna sitting on a wooden grinding mortar. When He saw her with a stick in her hand, He began to run away from her in fear. She didn’t really intend to strike Him, but she felt that she needed to show the stick to enforce some discipline, because, like every mother, she wanted her son to be good and well-behaved and disciplined, according to her conception. So, baby Krishna began to flee in fear. He was small and agile, and she had a large body, so He could escape her. She pursued Him and became tired, but she was so determined and sincere in her desire to catch and train baby Krishna that eventually He felt compassion for her and allowed her to catch Him. After catching Krishna, Mother Yasoda thought that she should tie Him up, not as a punishment, but to keep Him from getting into more trouble. So, she took a length of rope and attempted to bind Him around the waist. But the rope was too short by the width of two fingers. She got some more rope and added it to the first length of rope and still the rope was too short by two fingers. And she got some more rope and added it, but still the rope was too short. Mother Yasoda became perplexed: every morning she would dress baby Krsna and tie His ornamental belt around His waist, and she knew how big His waist was and how long the belt had to be, and the length of the ropes now was much longer, but still the ropes couldn’t reach around Krishna’s waist. Mother Yasoda was the wife of the king of the cowherd community, and she had lots of ropes for various purposes. Yet even after putting together all the rope she could gather, still she couldn’t get it to fasten around baby Krishna’s belly. Then Krishna, in appreciation of her ardent desire and endeavor to serve Him, took compassion on Mother Yasoda and allowed her to bind Him. But actually, He was bound not by her ropes, but by her love. Srimad-Bhagavatam, describing the story of Mother Yasoda and Lord Damodara, explains that Krishna cannot be caught by the greatest yogis, but still He allowed Himself to be caught by Mother Yasoda. Krishna cannot be bound by any means, but still He allowed Himself to be bound by the ropes—by her love. Many learned scholars have commented on this particular pastime of Krishna, and Jiva Gosvami has explained on the basis of this pastime how the Lord can be bound. Of course, Lord Krishna Himself declares that He can be conquered only by the pure love of His devotees, and the pastime here demonstrates that He was indeed bound by such love. But what exactly is the process of binding Krishna and developing pure love? Srila Jiva Gosvami explains that there are two factors, signified by the two fingers by which the rope was too short. He states that one finger represents the endeavor of the devotee. 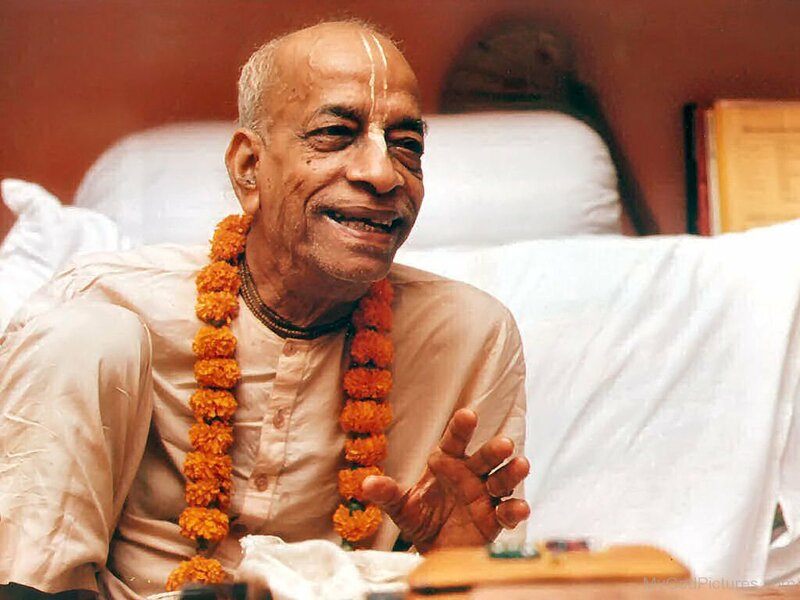 For example, in Krishna consciousness we have certain basic practices, the most essential of which is chanting the holy names of Krishna, while following certain basic principles of purity. As one is able, one should rise early in the morning and have a program similar to the program that devotees have in the temple. But the essential process really is chanting and hearing about Krishna and endeavoring to serve Krishna according to one’s capacity and taste. So, part of the two fingers’ gap can be closed by the devotee’s hard labor (parisrama), and Mother Yasoda showed that effort. She really tried her best to bind Krishna to the extent that she may have put together miles and miles of rope, but still her effort alone was not enough. So, the other factor that allows the devotee to bind Krishna is Krishna’s mercy (krsna-krpa). When Krishna was pleased with Mother Yasoda’s endeavors, He mercifully allowed Himself to be bound. Thus the other half of the gap, the second finger, was closed. Recently a devotee told me that her brother, who is a Christian missionary, had challenged her, “How will you go to the kingdom of God?” She replied, “I will go the kingdom of God by chanting the holy names of God.” Then the brother said, “Oh! You think you can go to the kingdom of God by your own endeavor, by works. No. One cannot go by works; one can go only by grace.” And what her brother said is true. One cannot go by works alone. “Works” in this context means spiritual practices or following the injunctions of the scriptures, the law. But it is very unusual for a person to reach the kingdom of God without making any effort, just thinking, “I’ll wait for the grace of God.” So, the conclusion we reach from the story of Lord Damodara, from the instructions of the acharyas and the instructions of Lord Krishna Himself in the Bhagavad-gita, is that we work to the best of our ability but at the same time depend on the mercy of the Lord for our success. The acharyas have given two examples. One is the example of the mother monkey and the baby monkey. The baby monkey holds on to the mother and puts his little arms around her and holds on. And as the mother monkey is swinging and flying from tree to tree, the baby monkey is in a very precarious position because the baby just has his little arms and he has to hold on to his mother for dear life as she swings from tree to tree. At any moment he could lose his grip and fall down. The other example is the mother cat and the kitten. The mother cat picks up the kitten in her mouth and carries the kitten. And the kitten really doesn’t have to do anything. The kitten just allows the mother to carry him or her to wherever the mother wants. In a broader context, the karmis, jnanis, and yogis are like little monkeys that are trying to hold on with their own strength, and therefore they are always in anxiety. They are in anxiety because they do not know if their strength will be sufficient to bring them to their destination. The devotees, however, are like the kitten that doesn’t really have to worry. The kitten just surrenders to the mother, and the mother picks up the kitten and takes the kitten to the destination. 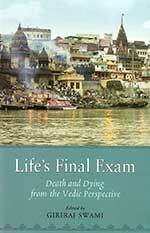 Now, if we look closely at the life of the devotee, yes, ultimately the devotee is picked up by the grace of the Lord, but still the devotee makes efforts to serve the Lord, and then the Lord’s mercy allows the devotee to bind the Lord, or to bring the Lord under the control of the devotee’s love. So, if someone thinks he or she can, as they say, storm the gates of heaven, or reach God by one’s own endeavor, that is not correct. But then again if someone says, “Well, I am just going to sit and pray to God to deliver me, and I am not going to make any effort,” that also is not complete. So, we do both. The kingdom of God actually has different divisions, or sections, and the highest is Vrindavan, Goloka Vrindavan, and the special feature of Goloka Vrindavan is that there the love of the devotees is completely spontaneous. The devotees there do not think, “Krishna is the Supreme Personality of Godhead, and therefore I must serve Him”; they are spontaneously attracted to Krishna according to their particular mood of service. For example, the cowherd boys are attracted to Krishna as their friend. They are not thinking that He is God; they just love Him as their best friend. Similarly, Mother Yasoda and Nanda Maharaja are not thinking that they have to serve Krishna because He is the Supreme Personality of Godhead. Rather, they are thinking, “Oh, Krishna is our son. We have to nourish Him and protect Him and educate Him.” Similarly, other elders in Vrindavan have a mood of parental affection. And the young ladies of Vraja are spontaneously attracted to Krishna because they think He is a handsome young man and they want to make friends with Him. So, in the Damodarastaka, with reference to the pastime of Mother Yasoda binding Krishna, the author says that by being bound by Mother Yasoda’s ropes, by her love, Krishna shows that He is conquered only by pure love. Here “pure love” means not just without any material motivation, but without any conception at all that Krishna is the Supreme Personality of Godhead and without any attraction for the opulence of the other sections of the kingdom of God called Vaikuntha, where the Lord’s opulence is prominent. Only in Goloka Vrindavan do the devotees have such pure love that they forget that Krishna is God. And thus, they are not bound by any restrictions or barriers, thinking, “Oh, Krishna is God. He is great, and I am small.” They treat Him as an equal, as a friend, or even as a dependent, as a son or pupil. In the other section of the kingdom of God, Vaikuntha, the devotees are aware of Krishna’s opulence—His majesty, His greatness. Therefore, they serve Him in a mood of awe and reverence. At most, there may be a sense of friendship, but even the friendship is mixed with a sense of awe and reverence, and although the love is pure in that it is without any material desire, it is not pure, natural, spontaneous attraction but is mixed with the knowledge of Krishna’s supreme opulences. That love is not sufficient to bind Krishna, to bring Krishna under the control of the devotee. Not that Krishna actually ever comes under the control of the devotee, but He comes under the control of the devotee’s love. So, the Damodara pastime also proclaims to the world that Krishna can be conquered only by pure love, which is not mixed with the conception of Krishna’s supreme opulence and Godhood. Q: Can you tell me if a person, who after so many lifetimes on earth eventually departs to Vaikuntha, can make further advancement from Vaikuntha to Krishnaloka? GS: Each devotee has eternal love for Krishna within the heart, and by chanting Hare Krishna the eternal love is manifest. Now, whatever one’s particular type of love is, it is just right for the individual, and the individual will feel fully satisfied in his particular relationship with the Lord. For example, if you tell Hanuman that his mood of service to Rama is not the highest, that he should give up the service of Rama and come to Krishna, he’ll say, “No way!” because he is fully satisfied in his service to Lord Rama and wouldn’t want to exchange it for anything. But there are rare instances, as the case of Gopa Kumara described in Brhad-Bhagavatamrta, when a devotee moves on. Gopa Kumara went to Vaikuntha, and although Vaikuntha is the spiritual kingdom of God and everything there is eternal, full of knowledge, and full of bliss, and everyone there is absorbed in the same mood of service to the Lord with awe and reverence in the opulence of Vaikuntha, still somewhere within his heart he didn’t feel completely satisfied, and ultimately he came back to earth, to Vrindavan on earth, the best place to perform practices to go to Goloka Vrindavan. And from there he was promoted to Goloka Vrindavan. So, it may be that one reaches Vaikuntha but hasn’t really developed one’s full love for Godhead. Then one may, as you say, make further advancement to Goloka Vrindavan. Q: I have heard that Jesus Christ has his own planet. Can people who go there move on after further knowledge of self-realization and eventually go to Vaikuntha or Goloka Vrindavan? GS: Your basic question is whether someone can go to the planet of Jesus and make further advancement, and the answer is, “Yes.” But I would hesitate to claim that I have a definite answer as to where his planet is. Still, I can say that wherever it is, one could make further advancement. And the planet of Jesus could be in the spiritual world, or it could be a heavenly planet within the material world. Srila Bhaktisiddhanta Sarasvati Thakura said that he accepted Jesus Christ as a saktyavesa-avatara. Saktyavesa means “one who is empowered by God, for some particular purpose,” and avatara means “one who descends.” One category of saktyavesa-avatara comes from the kingdom of God into the material world, empowered by the special potency of God. But in principle, someone who is already in the material world could also be empowered with some special potency from God. So, accepting Jesus Christ as a saktyavesa-avatara does tell us that he descended and that he was empowered by some special potency from God. However, Srila Bhaktisiddhanta didn’t tell us exactly where he descended from, and I would not like to venture to guess, but I would say if someone is a sincere follower of Jesus Christ and follows the instructions of Jesus Christ, he could definitely, eventually enter into the kingdom of God.